Home : Prairie Blog : All News : The Prairie School Book – A Great Gift! The Prairie School Book – A Great Gift! This special Commemorative Keepsake Edition celebrates the unique traditions, inspiration and vision which make The Prairie School a place where children’s dreams are born. Its growth and rise have been made possible through the ongoing support and commitment of its original “founding families” and that of its ever-growing Prairie family of teachers, parents and students. It is to this partnership that this book is dedicated. 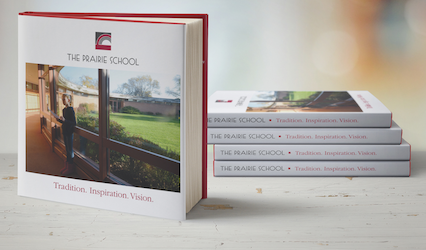 Luxury linen hard cover, foil stamped, premium art quality printing, “The Prairie School: Tradition. Inspiration. Vision.” is a 120 page limited run keepsake just for our Prairie Family.